A spontaneous iliopsoas muscle hematoma is relatively rare and often associated with abnormal coagulation. Nafamostat mesilate is an anticoagulant agent that is sometimes used to treat hemodialysis patients at high risk of bleeding. Although severe drug allergy caused by nafamostat mesilate was previously reported, spontaneous iliopsoas muscle hematoma secondary to disseminated intravascular coagulation caused by nafamostat mesilate allergy has not yet been reported. Severe nafamostat mesilate allergy occurred in a 78-year-old male patient with a 2-year history of hemodialysis. During hospitalization, disseminated intravascular coagulation occurred followed by a progressive iliopsoas muscle hematoma a few days later. Emergent transarterial lumbar artery embolization was successfully performed. 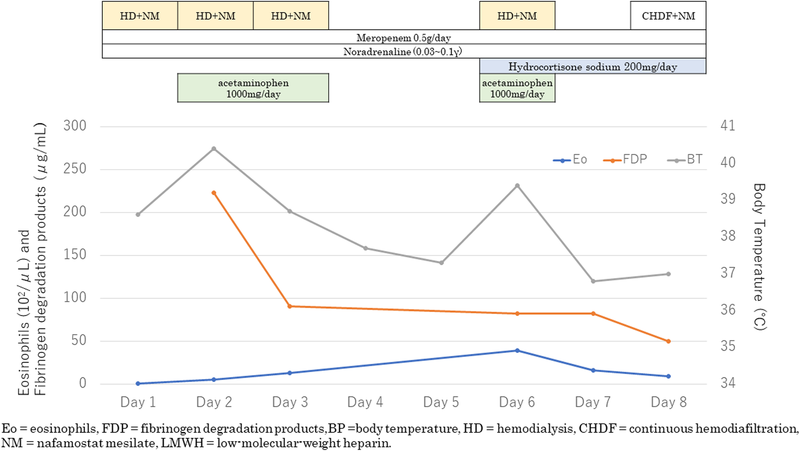 For dialysis patients, a detailed medical history including repeated nafamostat mesilate use and considering an allergy to nafamostat mesilate in differential diagnosis are critical. In addition to early diagnosis, when an iliopsoas hematoma occurs, early intravascular treatment is important. Spontaneous iliopsoas muscle hematoma is a relatively rare disease. It is related to abnormal coagulation in a patient or oral administration of the anticoagulant. Although radiological examination enables early diagnosis of the condition and interventional radiologic techniques have progressed, spontaneous iliopsoas muscle hematoma has a high mortality rate [1, 2]. In Japan, patients on hemodialysis who are at high risk of bleeding are sometimes treated with nafamostat mesilate because of its short half-life. Some allergic reactions to nafamostat mesilate, including severe conditions, such as anaphylactic shock, have been reported in recent years [3, 4]. Patients with hemodialysis are generally at high risk of bleeding because of the usage of anticoagulant drugs during hemodialysis, and some case reports showed cases of iliopsoas hematoma for patients in hemodialysis [5–10]. 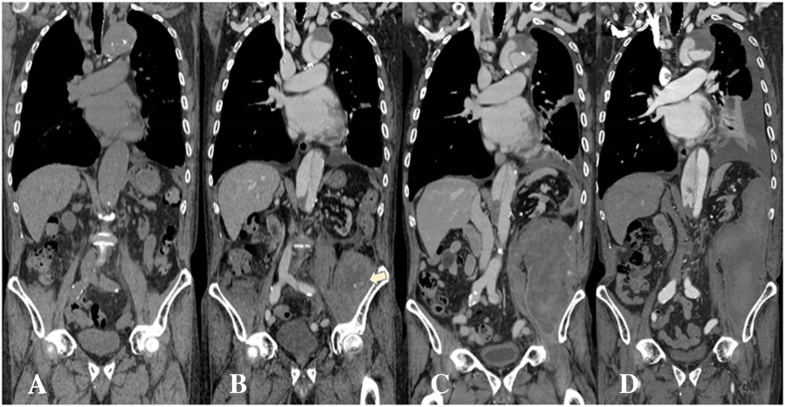 Here, we report a rare case of spontaneous iliopsoas muscle hematoma with disseminated intravascular coagulation (DIC) due to severe allergy caused by repeated administration of nafamostat mesilate. A 78-year-old male with established end-stage renal disease secondary to operation for aortic dissection who had been on hemodialysis for 2 years was hospitalized due to high fever and hypotension after dialysis. On the day prior to admission, we had changed the anticoagulation agent administered during hemodialysis from intravenous heparin to intravenous nafamostat mesilate because of mild oral bleeding during dialysis. The patient’s clinical parameters on admission are shown in Table 1. According to these test results, septic shock was strongly suspected. Therefore, we examined two sets of blood culture and started intravenous administration of noradrenaline (0.06 μg/kg/min) and meropenem (0.5 g/day). On the second day of hospitalization, liver dysfunction and coagulation were observed. The patient’s biochemical and coagulation examination results were white blood cell count, 13,300/μL; platelet count, 71,000/μL; AST, 266 IU/L; ALT, 166 IU/L; γ-glutamyl transpeptidase (γ-GTP), 125 IU/L; fibrinogen degradation products (FDP), 225 μg/mL; fibrinogen, 89 mg/dL; and prolongation of prothrombin time, 7.9 s. According to the International Society on Thrombosis and Haemostasis criteria, the total DIC score was 7 points. Based on these findings, we diagnosed the patient with DIC. On the day 6 of hospitalization, hematological examination revealed elevated eosinophils (3870 μ/mL) and procalcitonin (126 ng/mL). In addition to this, the patient’s febrile condition and hypotension presented only during hemodialysis. The blood cultures performed at admission were all negative. These findings indicated that not sepsis but some kind of severe allergic reaction had occurred. Furthermore, the only drug introduced during the clinical course was nafamostat mesilate. Therefore, we diagnosed the patient with DIC secondary to severe allergy to nafamostat mesilate. We stopped the administration of antibiotics, started intravenous administration of hydrocortisone sodium succinate (200 mg), and changed the anticoagulant administered during dialysis from nafamostat mesilate to low molecular weight heparin. However, his drug-induced lymphocyte stimulation test (DLST) results were negative. After changing the treatment, the patient’s fever soon subsided (Fig. 1). On the eighth day of hospitalization, he complained of pain in his left thigh. Contrast-enhanced computed tomography (CECT) showed an iliopsoas hematoma with extravasation from a lumbar artery (Fig. 2b). We chose a noninvasive treatment for this condition, beginning with an intravenous transfusion of 8 units of fresh frozen plasma (FFP) and 2 units of red blood cell concentrate (RBC). For several days, the patient’s condition remained stable. On the 15th day, the size of the hematoma appeared almost unchanged, as evaluated by non-contrast CT.
On the 24th day of hospitalization, we observed a sudden drop in his hemoglobin level from 9.7 to 6.7 g/dL; platelet count, 73,000/μL; AST, 17 IU/L; ALT, 6 IU/L; γ-GTP, 125 IU/L; FDP, 99.2 μg/mL; fibrinogen, 185 mg/dL; and prolongation of prothrombin time, 41.8 s. CECT showed that the iliopsoas muscle hematoma had considerably increased in size. In addition, extravasation from the lumbar arteries was observed (Fig. 2c). 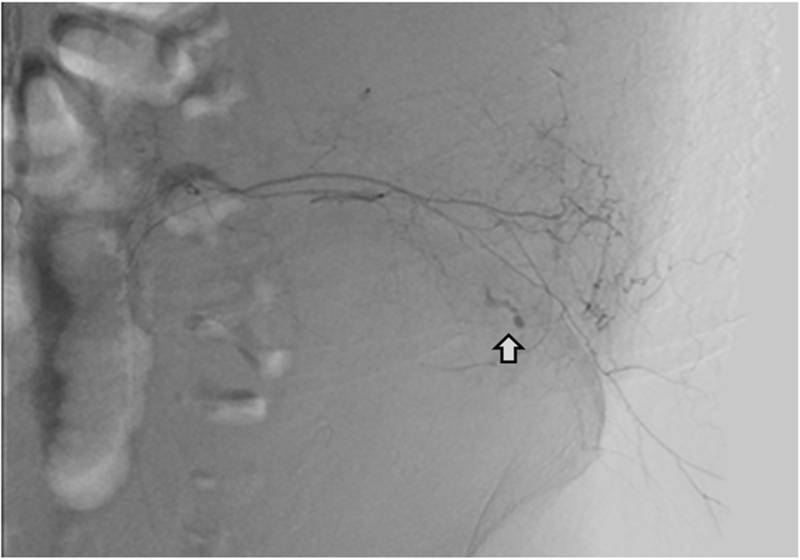 We determined that an invasive treatment was critical, and he subsequently underwent an emergent selective transarterial embolization of collapsed lumbar arteries (Fig. 3). On the 44th day of hospitalization, all drug treatment was discontinued and the patient started rehabilitation. On the 108th day, he was discharged from the hospital. In this case, we encountered a spontaneous iliopsoas muscle hematoma due to DIC caused by severe allergy to nafamostat mesilate. Spontaneous iliopsoas muscle hematoma is a relatively rare disease where the etiology is a collapse of the small arteries. The disease can occur in patients at high risk of bleeding. According to previous reports, the mortality rate is as high as 30–34% [1, 2]. Popov et al. classified intraperitoneal and intramuscular hematomas into three types and three subtypes: type I—no active bleeding in a patient in a hemodynamically stable condition, type II—active bleeding and no muscular fascia rupture, and type III—active bleeding and muscular fascia rupture; subtypes: type II-a—type II with no contraindication to cessation of anticoagulation, type II-b—type II with contraindication to cessation of anticoagulation, and type II-c—type II with no anticoagulation therapy or antiplatelet therapy. Although there are some case reports of iliopsoas hematoma in hemodialytic patients [5–10, 11], there are still no reports with spontaneous iliopsoas hematoma secondary to severe allergic DIC due to nafamostat mesylate. The review of literature on PubMed for iliopsoas hematoma in chronic hemodialysis patients is shown in Table 2. In general, noninvasive treatment is the first choice; however, when a noninvasive treatment does not improve the patient’s condition, minimally invasive surgery, i.e., interventional radiology (IVR), is a better treatment option . Although there are no defined criteria for selection of treatment, Popov et al. recommended type II-b, type II-c, and type III as indications for IVR . In this case, when the patient complained of pain in his left thigh, the hematoma had spread to the outside of the iliopsoas muscle fascia. Thus, the iliopsoas hematoma was classified as type III at the first diagnosis based on the classification of Popov et al. Although a type III hematoma is an indication for IVR, we initially chose a noninvasive treatment, which resulted in IVR treatment. While the patient survived, we should have selected immediate IVR at the first diagnosis of iliopsoas hematoma because the patient was not discharged until after more than 100 days. Nafamostat mesilate is a serine-decomposing enzyme inhibitor that results in anticoagulation through inhibition of the coagulation-fibrinolytic, complement, and platelet aggregation systems . Nafamostat mesilate is sometimes used to treat hemodialysis patients at high risk of bleeding because of its short half-life. Some allergic reactions to nafamostat mesilate, including severe conditions such as anaphylactic shock, have been reported in recent years [3, 4]. The diagnostic criteria for an allergic reaction to nafamostat mesilate are not yet established. However, Mise et al. proposed the following three diagnostic criteria: (1) Symptoms appear during hemodialysis when nafamostat mesilate is administered as an anticoagulant, and no symptoms are observed during treatment with other anticoagulants. (2) The possibility of allergic reactions to other drugs can be excluded. (3) The possibility of allergic reactions associated with diseases can be excluded. Additionally, Mise et al. reported that the frequency of allergy to nafamostat mesilate is about 1–2% among patients who have been re-administered with nafamostat mesilate. In our case, we diagnosed the patient with a severe allergy to nafamostat mesilate based on three observations. First, we observed elevated eosinophil levels and a febrile condition only on the days when the patient received hemodialysis, for which nafamostat mesilate was administered. Second, the discontinuation of nafamostat mesilate and administration of a steroid drug relieved the clinical symptoms. Third, infectious diseases such as iliopsoas muscle abscess were not suspected based on the clinical course. Because the abnormal coagulation continued even after DIC treatment, the patient was diagnosed with a hematoma. Nakajima et al. indicated that the residual dissection after surgical treatment of Stanford type A aortic dissection will decrease coagulation, which is a risk for DIC development . Although the coagulation test results were not examined before hospitalization, the platelet counts were ≤ 100,000/μL for 2 years. Therefore, it seems that DIC caused by nafamostat mesilate was prolonged by chronic aortic dissection in this case. Although we diagnosed anaphylaxis due to nafamostat mesilate, his DLST results were negative. According to the report of Ito et al., the sensitivity of DLST is only 60%; therefore, it might not be necessary for diagnosing an allergy . In this case, the DLST was considered to be false negative. However, blood pressure decreased within several hours after administration of nafamostat mesilate, which met the diagnostic criteria of anaphylaxis suggested by Simons et al. . In addition, anaphylaxis is a type 1 allergic reaction, and the involvement of type 1 allergy and DIC were suspected in this case. Although the pathway from a type 1 allergy to DIC has not been fully elucidated, it might be related to mast cell and eosinophil mediators such as platelet-activating factor [16–18]. Takeda et al. described the possibility of causing DIC by eosinophil cationic protein, and a few complications of eosinophilia and DIC have been reported . In this case, eosinophilia was increased and might have been an important factor in drug-induced DIC. The patient’s procalcitonin level on day 6 of hospitalization was abnormally high. In this case, both blood cultures yielded negative results, and CECT did not show any infectious source. Therefore, anaphylactic shock was strongly suspected. It is possible that the non-infectious pathway of procalcitonin increased due to increased oxidative stress after the administration of acetaminophen for hepatic injury caused by DIC [20–22]. This case of iliopsoas muscle hematoma from DIC secondary to allergy to nafamostat mesilate resulted in two clinically important conclusions. First, nafamostat mesilate allergy should be considered in the differential diagnosis of febrile patients with a repeated history of nafamostat mesilate treatment. Second, iliopsoas muscle hematoma with active bleeding in patients on hemodialysis is always classified as type II-b because anticoagulant drugs are generally administered during hemodialysis. Therefore, IVR may be considered a first-line treatment option. In Japan, nafamostat mesilate is often used as an anticoagulant in patients on hemodialysis who are at high risk of bleeding, and these findings may help us to achieve both early diagnosis and early treatment intervention when spontaneous iliopsoas hematoma occurs. We encountered a patient with iliopsoas muscle hematoma from DIC secondary to allergy to nafamostat mesilate. In Japan, nafamostat mesilate is sometimes used to treat patients on hemodialysis who are at high risk of bleeding. For dialysis patients, recording medical history of repeated nafamostat mesilate use and consideration of an allergy to nafamostat mesilate are critical. In addition to early diagnosis, when iliopsoas hematoma occurs, early intravascular treatment should be considered. The authors received no funding in relation to this manuscript. KN, HK, and AK provided the discussion and treatment of the patient. KN, TY, TF, and HK reviewed and revised the manuscript. All authors read and approved the final manuscript and agree with the submission to the journal.